Event: Fall Luncheon Speaker, NY Genealogical & Biographical Society – October 10, 2017, noon to 2 p.m. The 2016 Fall Benefit Luncheon was such a success that we are making it an annual event. Proceeds from the event will help to support the NYG&B fulfill its mission of preserving, documenting and sharing the stories of families across New York. This year will feature a talk by Brooke Kroeger about her book, The Suffragents. Ms. Kroeger is a journalist, author of five books, a professor of journalism at the NYU Arthur L. Carter Journalism Institute and director of its MA unit, Global and Joint Program Studies, which she founded in 2007. The Suffragents is the untold story of how some of New York’s most powerful men formed the Men’s League for Woman Suffrage, which grew between 1909 and 1917 from 150 founding members into a force of thousands across thirty-five states. 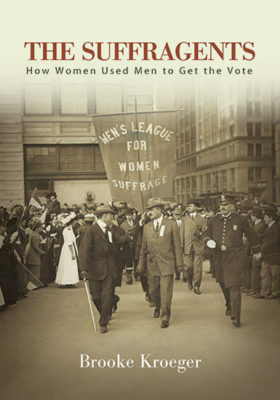 Ms. Kroeger explores the formation of the League and the men who instigated it to involve themselves with the suffrage campaign, what they did at the behest of the movement’s female leadership, and why. She details the National American Woman Suffrage Association’s strategic decision to accept their organized help and then to deploy these influential new allies as suffrage foot soldiers, a role they accepted with uncommon grace. Led by such luminaries as Oswald Garrison Villard, John Dewey, Max Eastman, Rabbi Stephen S. Wise, and George Foster Peabody, members of the League worked the streets, the stage, the press, and the legislative and executive branches of government. In the process, they helped convince waffling politicians, a dismissive public, and a largely hostile press to support the women’s demand. Together, they swayed the course of history. You may pre-order a book when you buy your ticket and then you can pick up your book at the luncheon. Ms. Kroeger will be signing books that day. Event: Holiday Book Signing at the Beekman Arms in Rhinebeck, NY, Sunday, November 5, 2017, 1 p.m. to 4 p.m.